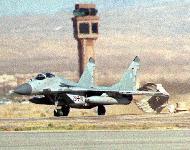 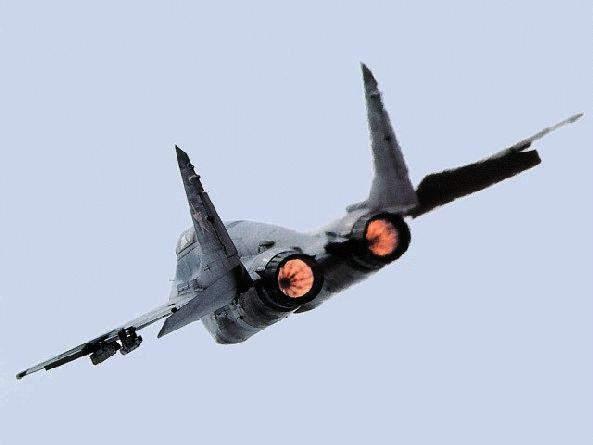 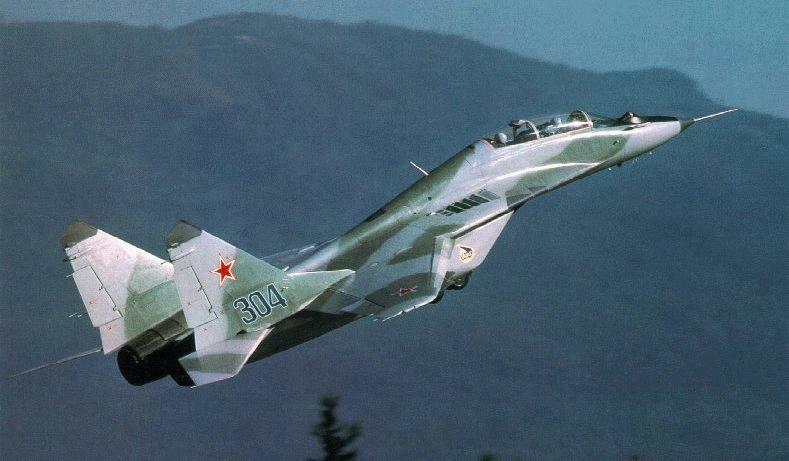 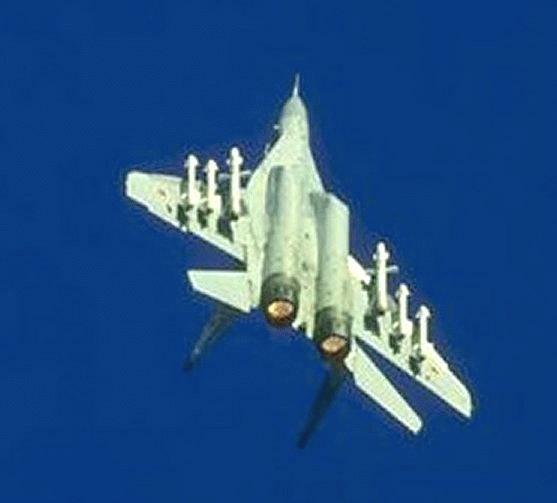 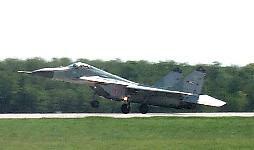 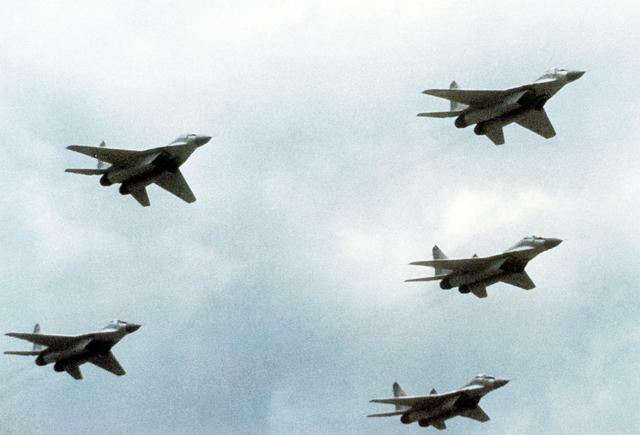 The MiG-29 is marketed worldwide and equals or surpasses the F-15C in several areas. 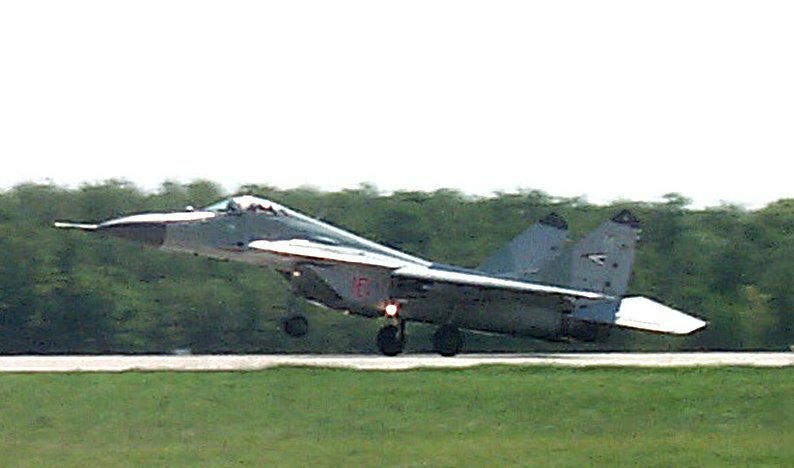 The MiG-29's wings are swept-back and tapered with square tips. 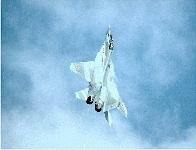 LERXs are wide and curved down to the front. 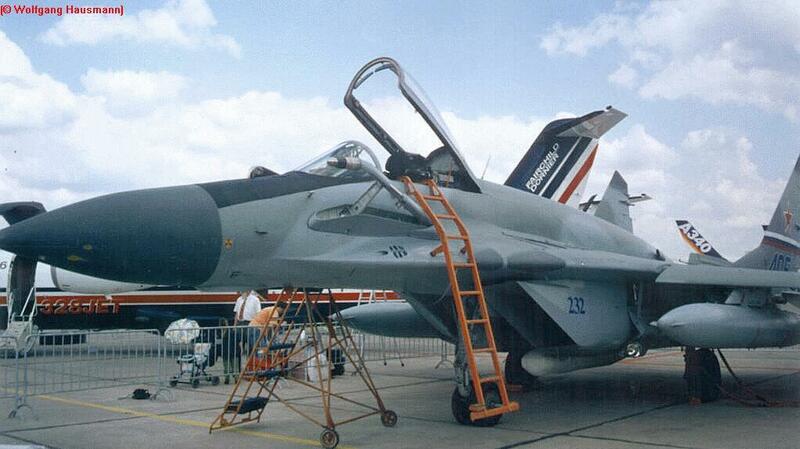 LERX begins on the nose below the mid-mount point, and the wings� trailing edges end at a high-mounted point. 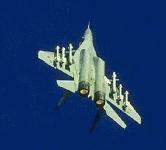 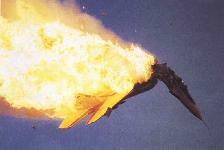 Twin jet engines are mounted low and to the sides of the fuselage. Diagonal-shaped air intakes give a box-like appearance. 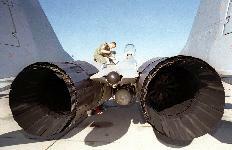 There is a large exhausts. 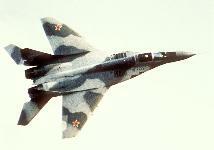 The fuselage is made of a long, thin, slender body with long, pointed drooping nose. There is a high-mounted bubble canopy. 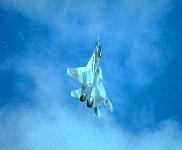 The tail fins have sharply tapered leading edges, canted outward with angular, cutoff tips. Flats are high-mounted on the fuselage, movable, swept-back, and tapered with a negative slant. 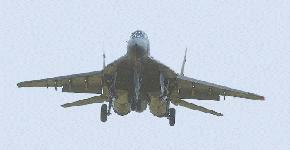 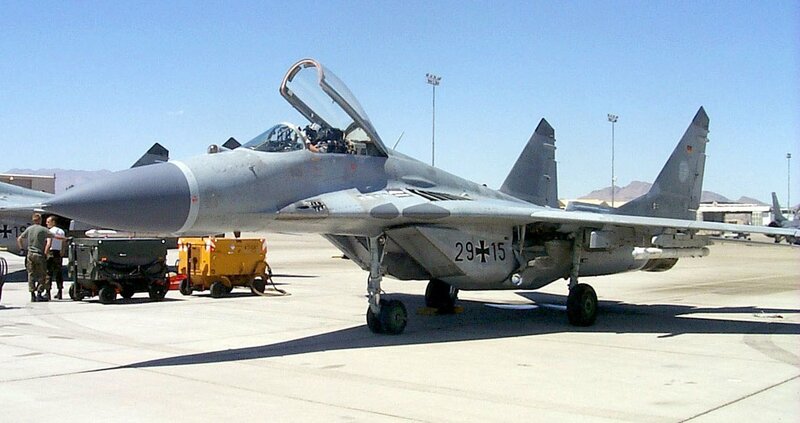 The MiG-29 is a widely exported aircraft, flown by Iraq, Iran, North Korea and Cuba. 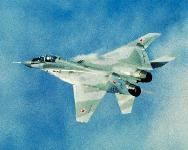 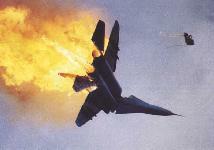 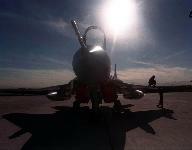 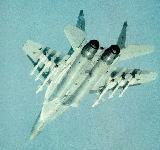 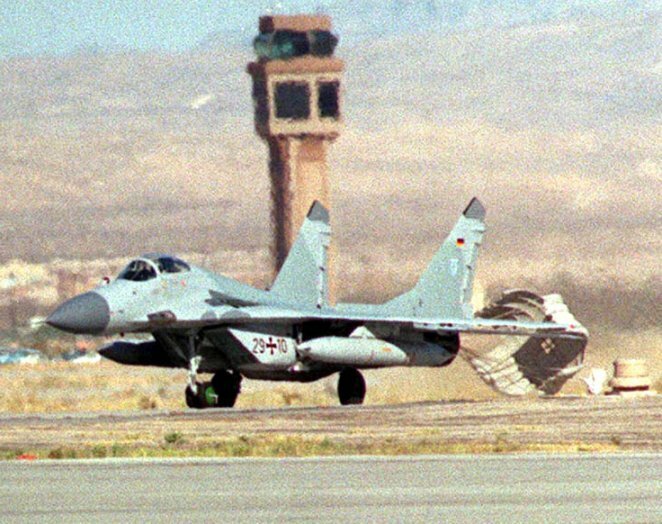 The MiG-29 has a few advantages over its more electronically advanced American counterparts. At about 40 miles apart, the American planes have the advantage because of avionics. At 10 miles the advantage is turning to the MiG. At five miles out, because of the MiG weapons sight and better maneuverability, the advantage is to the MiG. 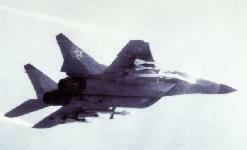 The weapons sight is a helmet-mounted system that allows the missile to follow the line of sight of the pilot's helmet. 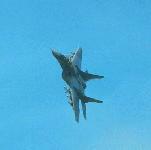 Where the pilot looks is where it goes. 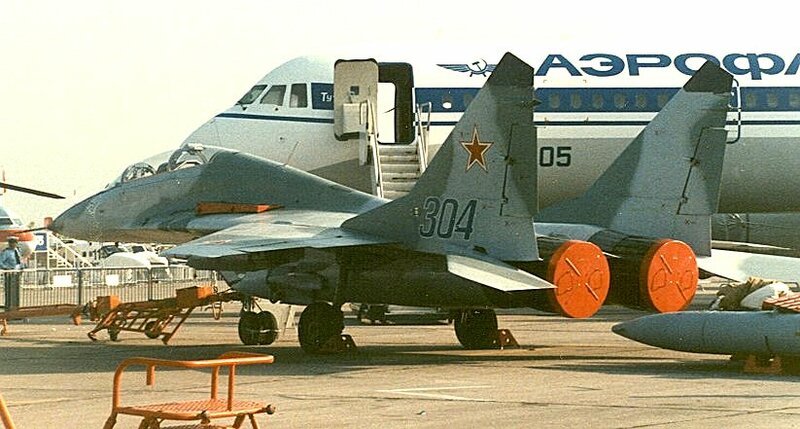 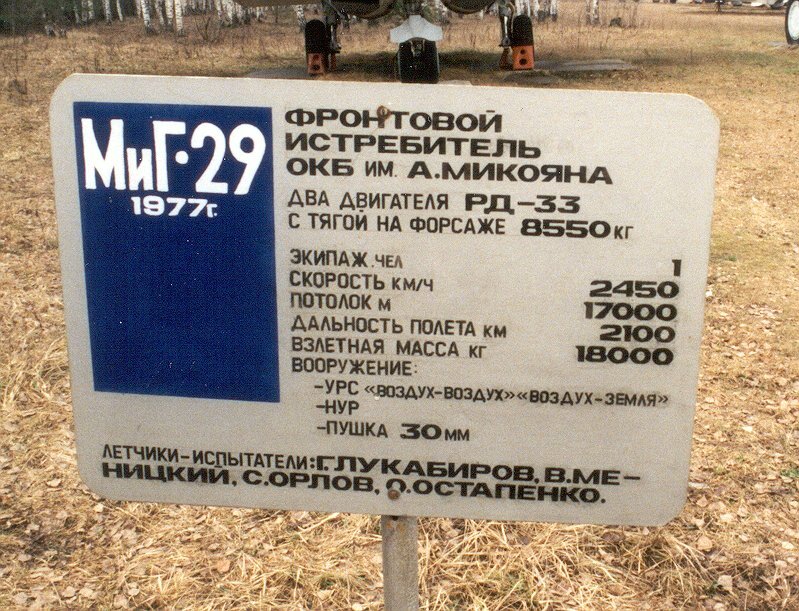 The MiG-29K was initiated in 1984 as a Russian Air Force development program for a multi-role fighter, and in 1989 - 1991 the MiG-29K underwent tests aboard the Admiral Kuznetsov aircraft-carrying cruiser. 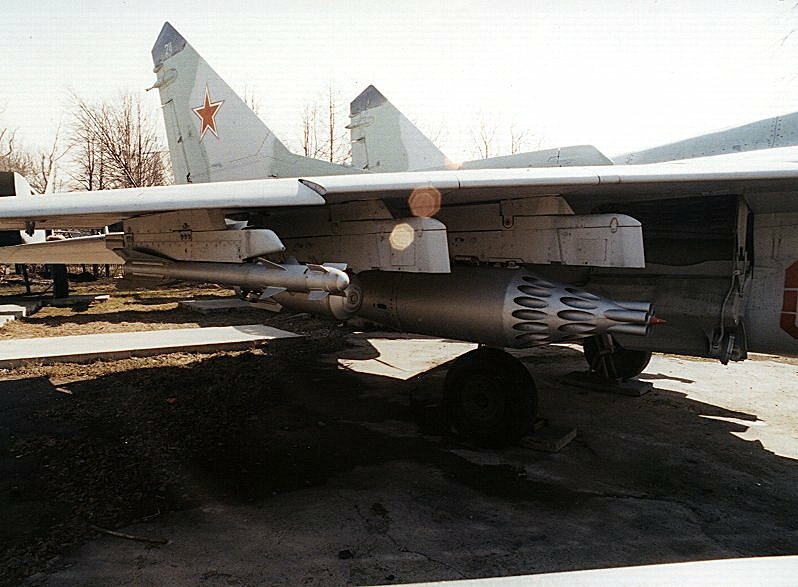 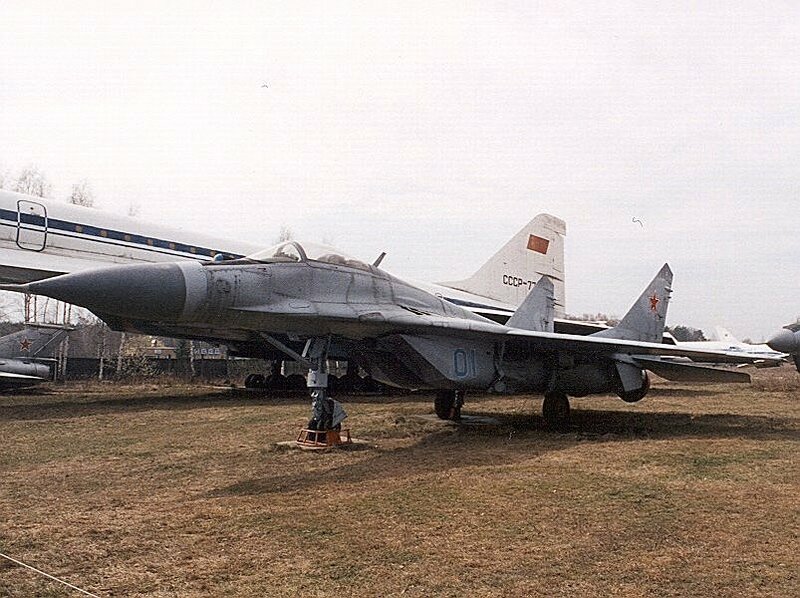 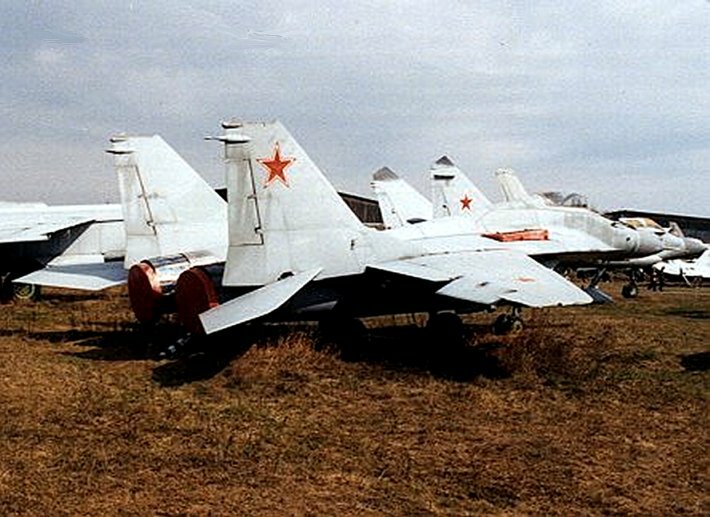 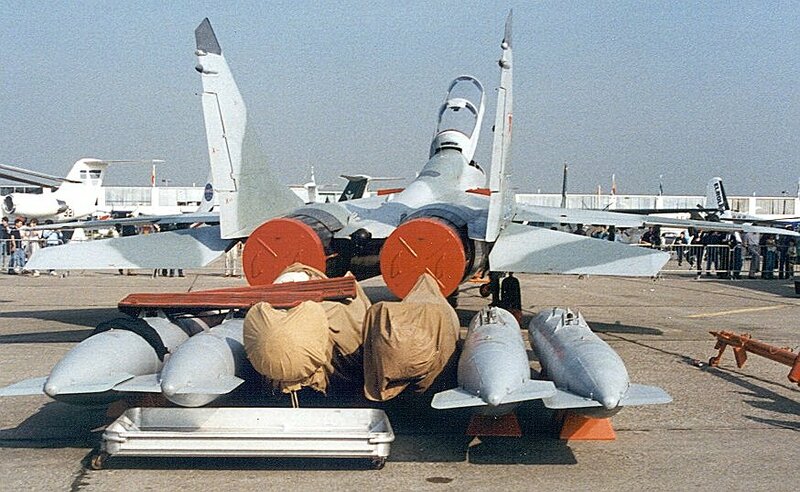 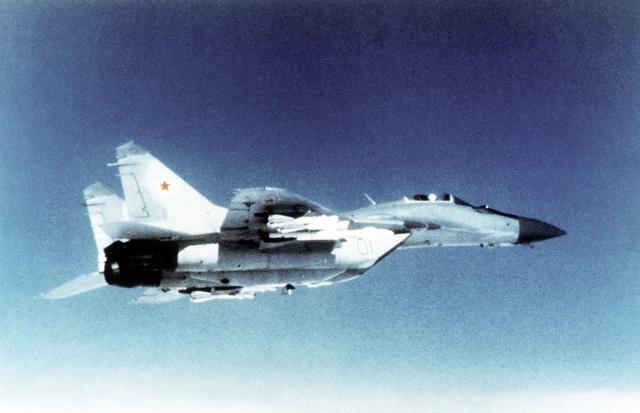 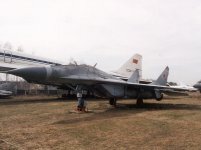 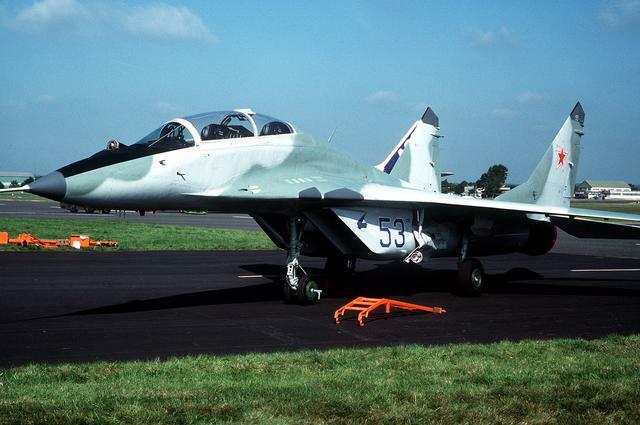 The MiG-29K differed from the MiG-29 production model, featuring a new multi-function radar, dubbed Zhuk; a cabin with monochrome display and use of the HOTAS (hands-on-throttle-and-stick) principle; the RVV-AE air-to-air active homing missiles; antiship and antiradar missiles; as well as air-to-ground precision-guided weapons. 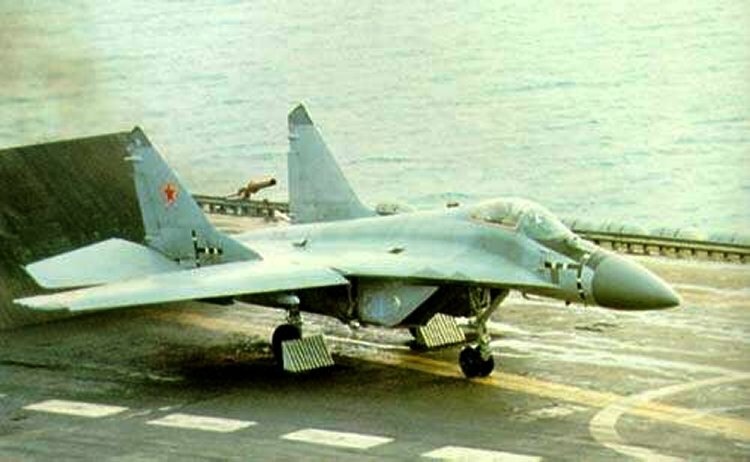 The MiG-29K program was revived in response to the decision of the Indian Navy to acquire the Admiral Gorshkov aircraft carrier. 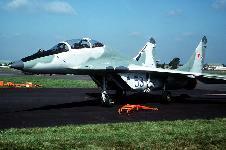 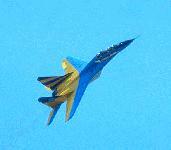 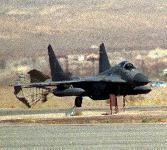 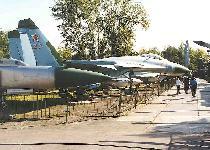 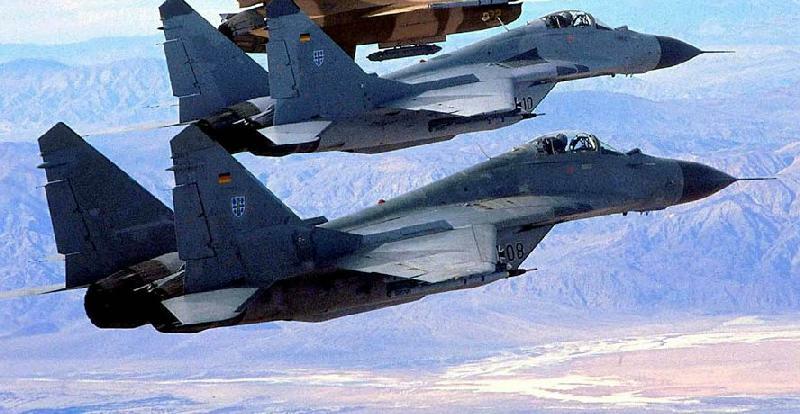 This called for the provision of the ship with a multi-role ship-based arrested- landing fighter of the MiG-29K size. 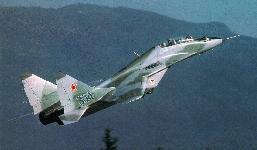 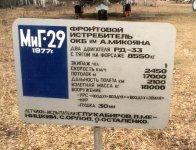 The ship's combat group will include 12 MiG-29K planes. 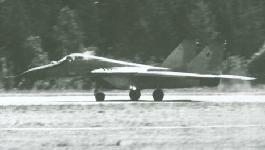 The aircraft has a remote control system, large-area (42 m2 vs 38 m2) folding wing, adjustable center-line air intakes with retractable screens protecting the engines during operation from ground airfields, reinforced landing gear, hook, corrosion- protected reinforced fuselage made specifically for deck-based aircraft. 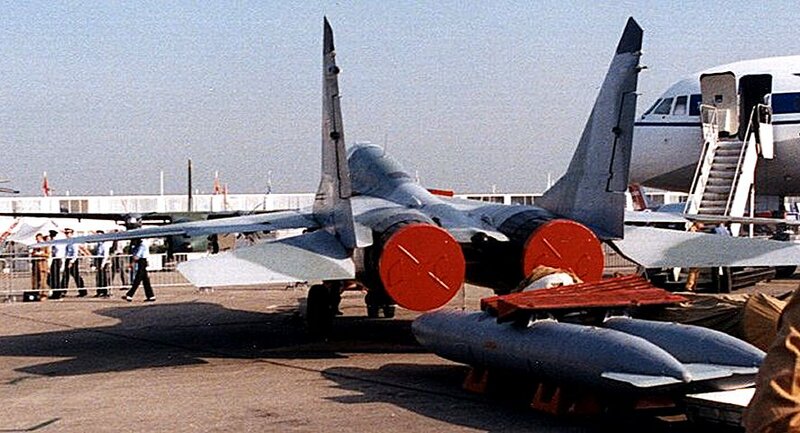 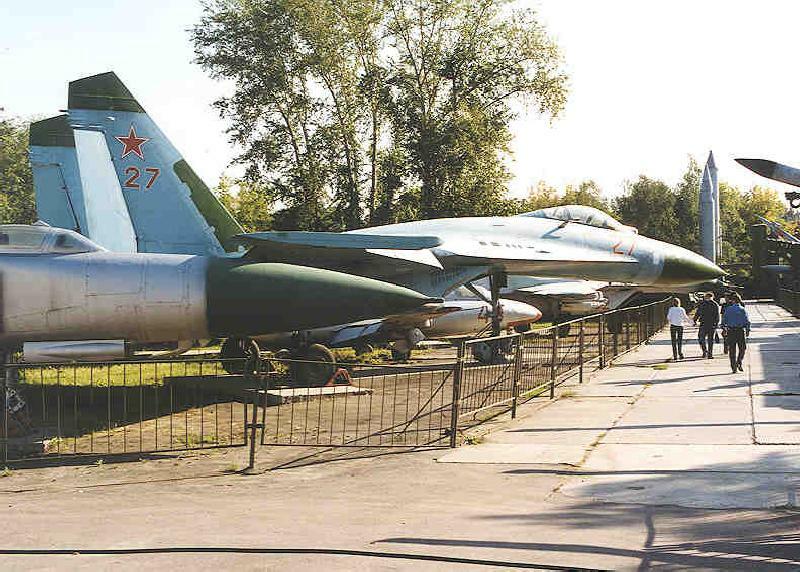 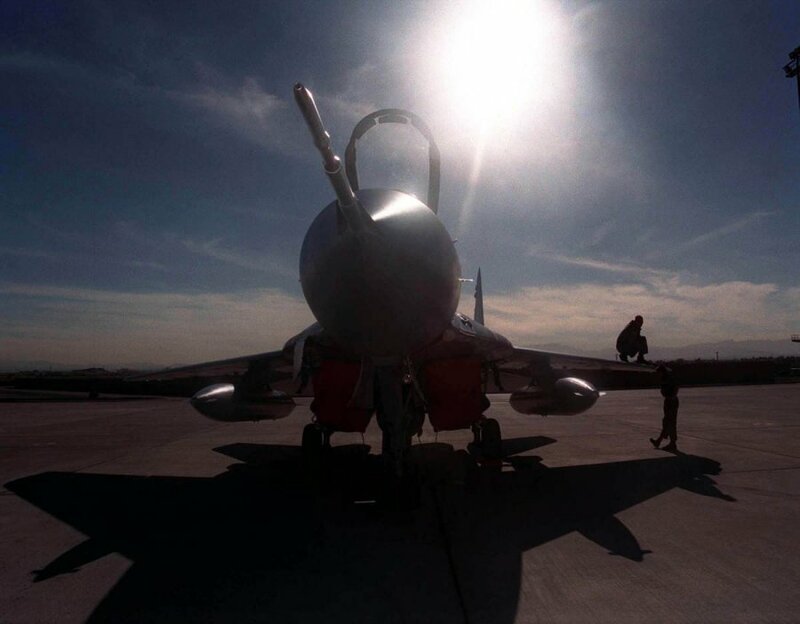 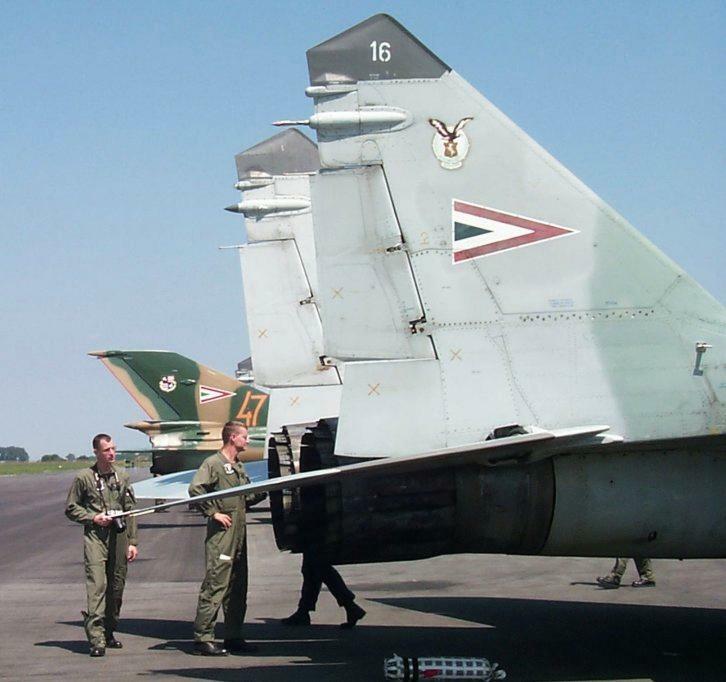 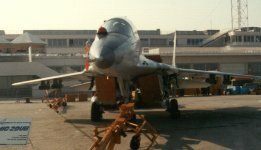 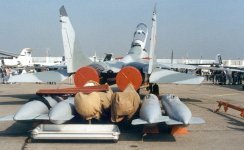 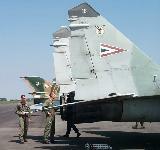 A Real MiG Deal: Looking 'under the hood' of a Russian FighterAirman May 1998 - So when the Republic of Moldova put 21 MiG-29 dual-role fighters - capable of carrying nuclear weapons - on the auction block last October, the Pentagon snatched them up before bargain hunters from unfriendly countries could get their paws on them.